This authentic Thai fish cake is one of my favourite Thai dishes. The taste of the fish cakes were great when they came out straight from my frying pan. I cooked the Spicy Thai Eggplants to go with it. I didn’t realize the eggplants and fish cakes were very good partners until I tried the other day. The Thai sweet and chili sauce was a must to add a kick, of course. How can we make bouncy and springy fish cakes? I used to follow my mother’s secret trick to make all kinds of fish cakes. In a food processor, put in fish, fish sauce, sugar, garlic, egg yolk, pepper and red curry paste and process to a thick paste. Transfer to a bowl, add spring onion, lemongrass, lime leaves and coriander. Stir in only one direction (clockwise or anticlockwise) and combine well, until you feel it’s elastic and hard to stir further. Wet your hands with a bit of water to shape 8 to 10 patties. In a heavy base skillet, heat oil over medium-low heat. Cook fish cakes in batches until both sides are golden and cooked through. Serve hot with lettuce, Thai sweet chili sauce. The intensity of saltiness of different brands of fish sauce is different. Adjust the amount of it accordingly. Love the flavours in these fish cakes. Love it! hey! This is very nice! It looks so appetizing! 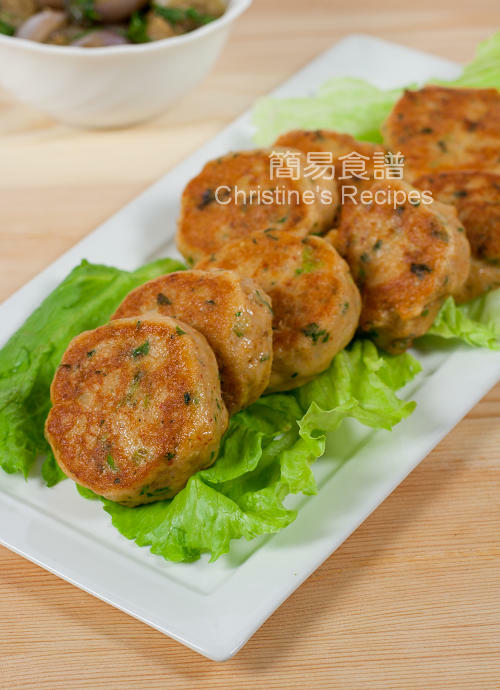 A very flavourful fish cake! kaffir lime leaf is a new ingredient for me...gotta check it out. Wow...looks irresistibly good. I bet it's very delicious with Thai sweet chili sauce. My children will like these. Yum..Thai fish cakes with chili sauce! Bookmarked! Fabulous spices. I love fish cakes and only home made ones. Thanks Christine for the incoming link. 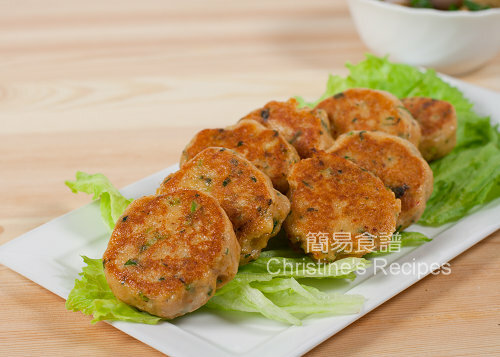 You remind me that I have to make again these tasty fish cakes, somehow the westerners like this a lot too even kids. I enjoy Thai fish cakes too. They are so delicious and not difficult to make at all. I love to make this too, but am often lazy in shaping them by hands, heart yours : ). Thanks for the link love!!! I have a bunch of leftover long beans, good idea, can make Thai fish cakes again. I'm so happy I stumbled upon your blog. You have some wonderful recipes. These fish cakes look delicious. These were really good, and easy! Took your suggestion and served with Eggplant, and it was a fabulous meal, even without the Kaffir lime leaves! I'll never buy store bought crab cakes again! So glad I discovered your blog. I just made these and they were lovely, very authentic tasting! thanks for sharing.